KILLDEER, N.D. -- Dustin Bergsing was 21 and six weeks a father when he arrived here at Marathon Oil Corp.'s Buffalo 34-12H well pad, a square of red gravel carved into a low hill. By dawn, he was dead. A co-worker found him shortly after midnight, slumped below the open hatch of a tank of Bakken Shale crude oil. It was Bergsing's job to pop the hatch and record how much was inside. An autopsy found he died of "hydrocarbon poisoning due to inhalation of petroleum vapors." An environmental engineer in Marathon's Dickinson, N.D., regional office heard about it a few days later. He'd been warning his bosses they were creating a dangerous buildup of lethal gases in their tanks. But, he said, they ignored him. "With that excessive gas, you get lightheaded," he said in a sworn statement to the attorney for Bergsing's family, Fred Bremseth. "It would be just like carbon monoxide. You're gonna doze off, and Katy bar the doors, man -- you're dead." An investigation of the drilling industry's worker safety record and what it means for those living amid the boom. Click here to read the series. Bergsing died in January 2012. At least three other men have died this way during the Bakken Shale boom, found lifeless on steel catwalks, next to the hatches they'd opened to measure the bounty of the shale. In each case, authorities at first assumed the men had been poisoned by hydrogen sulfide, or "sour gas," a well-known killer in the oil field (EnergyWire, Oct. 21). Most anyone in the oil and gas industry knows sour gas kills. Far fewer know the vaporous petroleum that collects in storage tanks can have the same effect -- a quick death. After being told in each case that the wells didn't emit hydrogen sulfide, authorities largely dropped the idea that the deaths were caused by their jobs, which in each case involved measuring the levels of the petroleum-laden tanks. But last month, the Occupational Safety and Health Administration fined the employer of one of the four men $2,800, charging the company failed to train its workers in the hazards of petroleum vapors. Zachary Buckles, 20, of Glasgow, Mont., was working for a small contractor, Black Gold Testing, in April when he was found dead with his head over a tank hatch at a Continental Resources Inc. well site south of Williston, N.D.
Eric Brooks, director of the OSHA office covering North and South Dakota, acknowledged OSHA had not taken action in similar, previous cases. "This is novel. This is new," Brooks said. "We're looking at the next generation of hazards, and these atmospheric hazards, I believe, are one of them." An EnergyWire investigation identified the cases of the four men -- Bergsing, Buckles, Blaine Otto and Trent Vigus -- from OSHA databases. 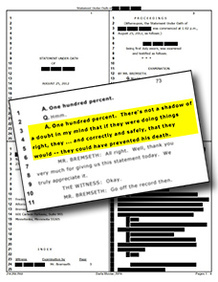 EnergyWire then obtained hundreds of pages of OSHA reports under the Freedom of Information Act, reviewed autopsies and court filings, and interviewed experts and people who knew the men. The documents show striking similarities between the four cases, which have each been treated differently. In some cases, the investigations show notable inconsistencies in their findings. 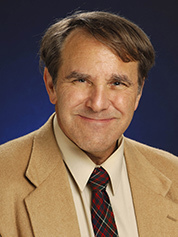 Robert Harrison, an occupational medicine specialist at the University of California, San Francisco, Medical Center who has investigated fatal chemical exposures in the workplace, said authorities such as coroners and medical examiners may be missing the signs of petroleum poisoning in oil field death cases. "That's certainly something we should be checking into further and doing additional investigations on whenever deaths occur suspiciously like this in the oil fields," he said. "And I'd say dying alone in the middle of the night in North Dakota is a pretty unusual circumstance." Standing at the bottom of the steps to the catwalk where Trent Vigus died, there is still a clear odor of petroleum. The beige stairs at XTO Energy Inc.'s Eugene 14X-8 well near Lambert, Mont., lead up about 20 feet to a catwalk along four tall metal tanks. Looking out from here, straight gravel roads cut through a corduroy of green and disappear across a treeless horizon. Gray paths branch off, winding a bit toward red gravel well pads. Vigus was born and raised hours west of here, in Butte, Mont. After high school, he bounced to Washington state and back. But in 2005, a friend told him there was good money to be made along the North Dakota border, working oil rigs. By July 2010, he was 30 and had worked his way up to chief of Nabors Well Services out of Glendive, Mont. The tank battery at Marathon's Buffalo 34-12H well pad. Dustin Bergsing died on the catwalk between the two tanks in January 2012. Photo courtesy of OSHA, obtained through the Freedom of Information Act. He worked the overnight shift on July 9, 2010, cleaning the Eugene well. Around 3 a.m., Vigus climbed a set of steel stairs to gather readings from the top of the tall, beige tanks. His co-workers found him in a fetal position on the catwalk. They carried him down and frantically tried CPR in the red gravel, with no response. The call came in to the ambulance crew as an oil worker overcome by sour gas. But the emergency room physician later ruled that out after a company safety supervisor arrived and said the well didn't have hydrogen sulfide. Vigus' death certificate states his cause of death as "hypertensive and atherosclerotic heart disease" -- hardening of the arteries. Essentially, it says he died of hardening of the arteries and a sudden cardiac "event" from an undiagnosed heart condition. But some of the postmortem results contradict that and suggest Vigus' exposure to chemicals may have contributed to his death. Laboratory tests turned up small amounts of propane and butane in Vigus' blood. Both these chemicals are found in Bakken crude. Other oil and gas chemicals could have gone undetected, because the test was done for recreational drug use ("glue sniffing" or "huffing") rather than exposure to industrial chemicals. The Billings, Mont., pathologist who did the autopsy, Thomas Bennett, wrote only that the toxicology test found caffeine and nicotine, ignoring the propane and butane results. Bennett wrote that Vigus died from a "sudden cardiac event, most probably due to his underlying enlarged heart from hypertensive cardiovascular disease." But Bennett didn't find any hardening of the arteries in Vigus' 30-year-old body. He wrote in his description of the heart that there were "no gross atheromatous narrowings" of the arteries. That would usually mean there is no atherosclerotic heart disease. In September 2010, a Nabors manager delivered the coroner's report to the Billings Area Office of OSHA, which promptly ended its investigation with no violations. An XTO spokeswoman referred questions to Nabors. Nabors spokesman Denny Smith said, "There was a thorough investigation by us and Nabors, and there were no claims against Nabors." Harrison, the UCSF physician who has investigated fatal chemical exposures in the workplace, reviewed autopsy and medical information on Vigus provided by his family. He says it is possible that the officials who investigated didn't understand the potential for hydrocarbon poisoning from exposure in the oil fields. Trent Vigus. Photo courtesy of Terri Vigus. "There was propane and butane found in Mr. Vigus' blood, and those are also chemicals in Bakken crude," Harrison said. Reached by phone last week, Bennett acknowledged Vigus could have been killed by the hydrocarbon vapors. "It could be," he said. "I can't rule it out." He noted that the results from the blood tests could still be re-examined for other hydrocarbons and should be if the family has doubts. "Back in 2010, we didn't know as much" about the dangers of petroleum vapors, Bennett said. "We're still learning how to test for these." The postmortem results and the OSHA report never made sense to Vigus' mother, Terri Vigus of Butte. Her son never had heart problems, and he'd passed a physical in March. They were close, she said. If he was feeling ill, she thinks he would have told her. Terri Vigus still has her son's zipped-up duffel bag in her garage in Butte. She can't bring herself to open it. "OSHA's report was very vague," she said. "I still don't feel the closure on it." Around the time Vigus died, on the other side of the state line in North Dakota, oil companies and government officials were contending with a new discovery: high levels of airborne petroleum blowing off well sites from crude oil storage tanks. All crude oil has compounds called volatile hydrocarbons such as benzene, butane and propane. Bakken Shale crude has a lot more of these compounds, also called volatile organic compounds, or petroleum vapors, than conventional oil. It's related to why shale oil is more prone to explode in rail cars. As early as 2009, companies and regulators in North Dakota realized that Bakken crude has more of the compounds than they'd expected, and that they were escaping from the vents in the tanks. "They thought it was a nominal amount. It turns out it wasn't a nominal amount," said Jim Semerad of North Dakota's Department of Health. Under the law, tanks are OK as long as they don't emit more than 100 tons per year. In most places, tanks don't even come close. But U.S. EPA records show some wells were emitting more than 2,000 tons per year. Uncorrected, that could have meant growth in ozone and haze in the open skies of North Dakota, and the possibility of EPA sanctions for air pollution. So state officials required tanks to be fitted with devices to reduce those emissions, generally high-efficiency combustors that burn it off. But that doesn't reduce the danger to workers. 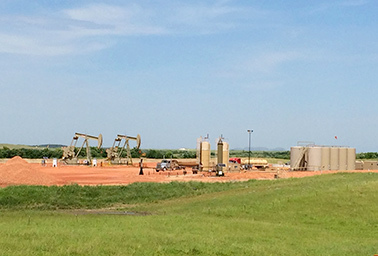 Marathon's Buffalo 34-12H well pad near Killdeer, N.D. Photo by Mike Soraghan. The National Institute for Occupational Safety and Health (NIOSH) said in a posting earlier this year that "acutely toxic" levels of gases can whoosh out of the tanks and is studying whether they might have caused oil field deaths. "Even a young guy could be knocked down," Harrison said. "Your heart could go into shock." A separate NIOSH study released this summer found high levels of benzene and VOCs among flowback operators in Wyoming and Colorado, although the levels were not deemed lethal (EnergyWire, Sept. 18). There are also indications of high vapor levels farther east. In February 2013, a worker at a work site was killed when hydrocarbons from a brine tank he was emptying exploded. 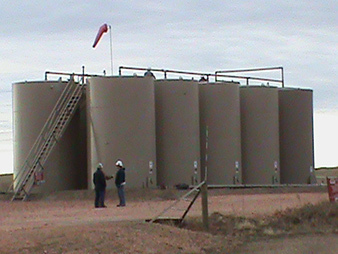 People who work around crude oil tanks are taught to check the direction of the wind and stand upwind when opening the "thief hatches" on the tanks. It is recognition of the danger, but it's haphazard compared to what worker safety experts at NIOSH recommend. They say companies should look into providing respirators to flowback workers and truck drivers who measure the tanks. Employees shouldn't work alone around the fumes. It would be even better, they say, if workers could get tank measurements without employees opening the hatches. But many states, including North Dakota, require that the measurements be taken in person, by hand. In an extensive statement to the attorney for Dustin Bergsing's family, a former Marathon safety engineer said petroleum vapors created a "deadly" environment on top of tank batteries. Click here to read the statement. One of the people who worked with EPA and North Dakota health officials on the issue of volatile organic compounds was a Marathon health, environment and safety specialist -- his title was "HES professional" -- who trained as a chemist. He started at Marathon in October 2011. Oddly, he said, the manager who interviewed him had asked just one question: "Can you keep your mouth shut?" The problem turned out to be not what he said, but what he wrote, according to Bremseth, the attorney for Dustin Bergsing's family. Marathon managers were upset that he put his questions and concerns in writing in emails. Unlike a spoken conversation, those could turn up as exhibits in a lawsuit. "They actually sent someone up to teach him how to write emails," Bremseth said in an interview. A few months after Bergsing's death, he was fired. He had contacted Bremseth when he read a news story about the suit the Minneapolis lawyer filed against Marathon in the Bergsing case. After his sworn statement, Marathon settled the federal lawsuit for an undisclosed sum that Bremseth described as "very substantial." EnergyWire obtained a transcript of his statement to Bremseth on the condition that he not be named. After he started at Marathon, he told Bremseth he'd started asking about fumes coming out of the tanks at production sites. Marathon was using one flare stack instead of two on well pads, and using undersized pipes. That made wells more profitable, he said, by making initial production seem higher than it really was. But it also created a hazard by diverting more gas into the tanks. "It's all about the bottom dollar," he explained. His boss, HES Supervisor Luke Franklin, made it clear he did not appreciate the emails. The specialist recalled what Franklin said shortly before Christmas in 2011: "If you write any more of those, I'm gonna have to fire you." In a few weeks, Franklin would be at the Buffalo well site in Killdeer, shepherding the OSHA officials investigating Dustin Bergsing's death. Reached by phone, Franklin referred calls to a Marathon spokesman who did not comment. Bergsing was born in Livingston, Mont., and lived in Edgar, outside Billings. He was, by all accounts, a good employee and, for a short time, a good father. He had a mop of unruly hair and a fondness for bull riding. It was at the Northern Rodeo Association Championships in Billings in March 2011 that he met Lacey Breding. They started dating the next day. Soon after, she was pregnant. They moved in together, talked about buying a house, got engaged and set a date for their wedding -- June 30, 2012. Shortly after Thanksgiving, she gave birth to a daughter, McKinley. In September, he'd started working for Across Big Sky Flow Testing. He lived in a trailer on the site for two weeks at a time, measuring the contents of the tanks twice an hour and checking them against what truck drivers were hauling off site. It was good money. There probably aren't many jobs in rural Montana where a 21-year-old can make more than $1,000 a week. Company owner Steve Polesky told a workers' compensation investigator that Bergsing "was very self-motivated and was one of those guys who took pride in his job." When he was home, Breding said he was better with their newborn than she was. "He was amazing," she said. "He would stay up during the night with her so that I could get some sleep. From the minute she was born, he dove right in as a father." It's a five-hour drive from Edgar to Watford City, N.D., a sleepy ranching outpost that has grown into a three-stoplight town clogged with tanker trucks. After Watford City, there's still miles to drive to get to the Buffalo 34-12H pad. There are lonely two-lane roads, then a dirt road that winds past flares and rangeland, through striped badland breaks to a patch of red gravel with two churning pumpjacks and two rows of tall beige tanks. Bergsing pulled his truck up to the site in time for his shift at 2 p.m. Jan. 6, 2012, but he got a speeding ticket doing it. That night, he was alone in his trailer texting back and forth with his fiancée. The last text, around 9:30 p.m., was about the ticket. At 1 a.m., a tank alarm went off at a Marathon facility, indicating a tank was getting too full. Marathon called Polesky, who dispatched an employee to see what was wrong. Jim Kime probably figured Bergsing had fallen asleep in his trailer and deserved a good chewing out. He switched the tank at the site and went up on the catwalk. When he saw Bergsing's body, he checked for hydrogen sulfide, but there wasn't any. Breding had stayed up all night since the last text at 9:30. McKenzie County Sheriff's Deputy Derrek Harju called her about 4:15 a.m.
"The sheriff called me and asked me for Dustin's parents' contact information, and he wouldn't tell me why," Breding testified last year. "And he told me that I was the only contact listed, and asked my relationship to Dustin. I told him I was his fiancée. And he told me that in that case, I should know that Dustin succumbed to H2S poisoning, gas poisoning, and that I should call the nearest friend or family to come be with me." A few days later, late at night, the Marathon HES professional got a call from a co-worker asking if he'd heard about the death at a well site. He hadn't. "He said, 'I walked up, and the guy was leaning up against the post up on the tank battery,'" he recalled. '"And, you know, it looks like he suffocated.'" He and some of his co-workers were puzzled by a newspaper article in which the local sheriff said he'd already ruled out inhalation of gas fumes as a cause of death, before there were autopsy results. "There's not a shadow of a doubt in my mind," he said in the statement, "that if they were doing things right, and correctly and safely they could have prevented his death." Marathon didn't make any changes after Bergsing died, he said. But in May, another young man nearly passed out at another well near Manning, south of where Bergsing died. Along with some co-workers, the HES professional took monitoring equipment out to the well, the Ernest Charchenko 14-33H. "We're talking the -- the oxygen content was below breathable," he said. "It had displaced the oxygen around the tanks. It was almost deadly. It was deadly." After that, he said, the company started providing respirators to people at well sites. He was fired in June 2012, he said, when he wrote a warning that conditions were so dry, well site flares could start a prairie fire. OSHA investigators decided not to fine Bergsing's employer, Across Big Sky Testing, after noting there was no indication of hydrogen sulfide poisoning. But the state workers' compensation agency, called N.D. Workforce Safety & Insurance, approved a claim for Bergsing's daughter to receive death benefits. Across Big Sky, though, is fighting the claim in court. In paperwork challenging the decision, Polesky's wife, Leann Polesky, wrote that Bergsing may have died as a result of "self-induced inhalation." The allegation is that Bergsing was "huffing" -- intentionally breathing in the fumes to get high. A hearing examiner found "no actual evidence" Bergsing intentionally inhaled the toxic fumes and ruled against the company. Still, Across Big Sky is taking the case to the North Dakota Supreme Court, which is set to hear arguments in the case Nov. 26. Marathon may have started providing respirators at its well sites. But Blaine Otto wasn't wearing one when he died. Otto, 40, drove a truck for Falco Energy Transportation. He was found slumped over a catwalk railing in July 2013 at a Newfield Exploration Co. well site in the Little Missouri National Grassland outside Keene, N.D. His face was next to a tank hatch. His eyes were open, but he wasn't breathing. Next to him were his tools for measuring and sampling the tank. North Dakota State Forensic Examiner William Massello says determining whether a death is work-related is not the exact science that many people want it to be. Photo courtesy of the North Dakota Department of Health. OSHA records indicate Otto's death was initially attributed to hydrogen sulfide. But North Dakota State Forensic Examiner William Massello ruled out hydrogen sulfide. Instead, he said Otto died of "cardiac arrhythmia" and said it was from natural causes. A claim for workers' compensation benefits in Otto's death was denied. Cardiac arrhythmia can be caused by inhaling hydrocarbon vapors. Massello himself pointed that out when he testified about Bergsing's death in the workers' compensation case. "It can sensitize the heart to the effects of adrenaline and you can get what we call fatal arrhythmias from this," Massello said in the 2013 deposition. After Otto's death, OSHA sent Falco a letter saying its employees should be given "four-gas meters," to warn them of dangerous vapors such as hydrogen sulfide or hydrocarbons. Brooks of OSHA said such a "hazard awareness letter" can be used in the future to show a company knew what needed to be done to protect employees. But OSHA didn't fine the company. The inspector's notes say no hydrogen sulfide or hydrocarbons were found in the autopsy. Without a witness or physical evidence, OSHA inspectors determined they couldn't issue a citation. A family member said the family has hired an attorney but wouldn't discuss the case. Newfield referred questions to Falco, which didn't respond to messages. Zachary Buckles was found on a catwalk at a Continental Resources Inc. well site near Williston with a sweeping view of the Missouri River. The McKenzie County Sheriff's Department originally reported that because Buckles, a flowback operator, was found over the open cover of a crude oil tank, "it is believed that he died as a result of [hydrogen sulfide] gas exposure." But, as with Otto, Massello, the state forensic examiner, listed the cause of death as cardiac arrhythmia (EnergyWire, July 8). In Buckles' case, inhalation of "petroleum vapor exposure" was listed on the state death report among "other significant conditions" along with obesity. Rather than "natural causes," the manner of death is listed as "undetermined." Attempts to reach Buckles' family members were unsuccessful. But the obituary they published in The Glasgow Courier said he died from a "work-related accident." A spokeswoman for Continental Resources said the company "is not aware of any dangers from hydrocarbon vapors or VOCs at any of our locations." But OSHA now says hydrocarbon vapors were a danger at Continental's well. It decided to fine Buckles' employer, Black Gold Testing, saying the company didn't prepare him for those dangers. The company has gone out of business, OSHA officials said, but agreed to pay the $2,800 fine. Brooks, who signed off on the citations, said the citation reflected growing questions and new concerns about the dangers of tank fumes. "When you have a combination of factors that might relate to a death, it can be challenging to lean it back to one event," he said. But "I think everyone can agree employees that are engaged in tank gauging operations have the potential to be exposed to lethal atmospheric hazards." In saying it knows of no dangers from vapors at its wells, Continental Resources also noted the state forensic examiner's classification of Buckles' death as cardiac arrhythmia. But in an interview, Massello said determining whether a death is work-related is not the exact science many people want it to be. "We get deaths in the oil field from hydrogen sulfide, and the vaporized alkane, hydrocarbon vapors," Massello said. "Sometimes we're not sure whether that played any role in the person's death or not, so we check off 'no.'" He said he knows of ongoing studies of the volatile compounds and the levels that have been established as toxic. "They're questioning whether the levels are really valid," he said. "And you know, that's a good question." A key issue, he said, is that the airborne compounds can affect different people in different ways. "One person might not even experience any effects, whereas other people might experience a fatal cardiac arrhythmia as a result of this and drop dead," Massello said. If the fumes from a tank can kill in an instant, public health experts say it signals risks for the people who live nearby. These are not drilling sites or frack jobs where a rig arrives, does its work for a few weeks and leaves. These tanks will be in place until the wells tied to them have drained all the possible oil from the Bakken formation, likely for years. Most are out on the prairie where there are more cattle than people, but some are in the middle of North Dakota's scattered population centers. For example, there's Williston, the hub of the Bakken boom. On the city's western edge, there's a 36-tank battery across the street from new housing developments where little girls in pink neon ride bicycles down white concrete streets. What effect are the tank emissions having on them? "Great question," said professor John Adgate of the Colorado School of Public Health. "Nobody's got any data." Adgate this year co-authored a review of public health risks from oil and gas sites that noted emissions from well sites likely pose risks for those who live nearby. The best information so far, he said, comes from the NIOSH study showing workers' exposure to concerning levels of benzene and other VOCs. "How that relates to those tanks as an emissions source is the next obvious question," he said. NIOSH officials, though, caution that their research isn't intended to provide information about exposure to the general population (EnergyWire, Oct. 23). Wilma Subra, a Louisiana environmental scientist who monitors the oil and gas industry, said NIOSH is wrong to play down the importance of its findings to the people who live amid the oil patch. "If the emissions are bad enough to cause death," Subra said, "they have to be causing severe health impacts." Click here to read the safety engineer's sworn statement.